Katie joins PFP with high expectations of impacting members to achieve goals in every area of their life, and is excited to continue her career as a Personal Trainer as she continues pursuing knowledge in exercise science and nutrition. Katie played three sports in High School and received a scholarship participating in women’s soccer and women’s softball at The College of Charleston, South Carolina. As an athlete, she recognized the importance of strength training and conditioning, in order for individuals to achieve goals, prevent long-term injuries, as well as maintaining a healthy adult life-style. Post-graduation, Katie spent four years at Mary Institute and Country Day School (MICDS) as Head Coach for the middle school girls’ program (soccer, basketball, field hockey, and lacrosse). During this time, she discovered the joy of coaching players both on and off the field, developing the skills of each sport as well as imparting character and integrity in the younger generation! 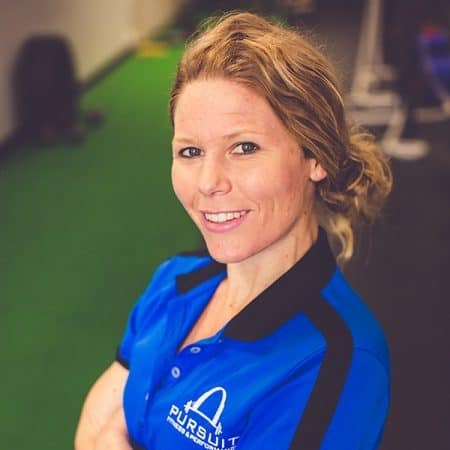 When Katie learned about the mission of PFP, “to inspire people to become the best version of themselves,” she was immediately drawn to the heart of PFP with an emphasis on building relationships, and is committed to serving, educating, and coaching residents in the city of St. Louis to be transformed “inside and outside” of the gym! Katie has a strong passion for encouraging people to utilize their unique strengths, skills, and gifts, and she is humbled and honored with the opportunity to assist members in accomplishing their goals. Katie considers herself “an open book coach,” and aspires to be a motivating teammate and resource to every member of the PFP community. Katie dedicates her personal life to building relationships with her family and friends, and she pursues any recreational sport that gives her the chance to sweat; On a given sunny day, you’re likely to find her on a local tracking running full-field sprints, or reading one of her favorite books, including: Isaiah, Revelation, John, and Romans!